Just Go To Bed by Mercer Mayer was published in print in 1983. It is a beloved story about Little Critter as he challenges his very patient father with lots of bedtime procratination. From pretending he general at war to a cute little bunny, Little Critter just doesn't want his day to end. But his parents are persistent in this adorable classic from Mercer Mayer. This digital version adds a new twist, having the reader try to find all the little mice (16 in all) hidden on almost every page. When the child taps on a mouse, a chime sounds; at the end of the book, a page is displayed with the number of mice (of the total) successfully found. This little extra was a big hit with my kid and made re-reading a bit more fun. As a parent, I liked this interactivity because it rewarded my child for paying attention, although it did distract from the story on the first reading. Like other omBooks by Oceanhouse Media, this app is interactive in a way that enhances early reading skills. 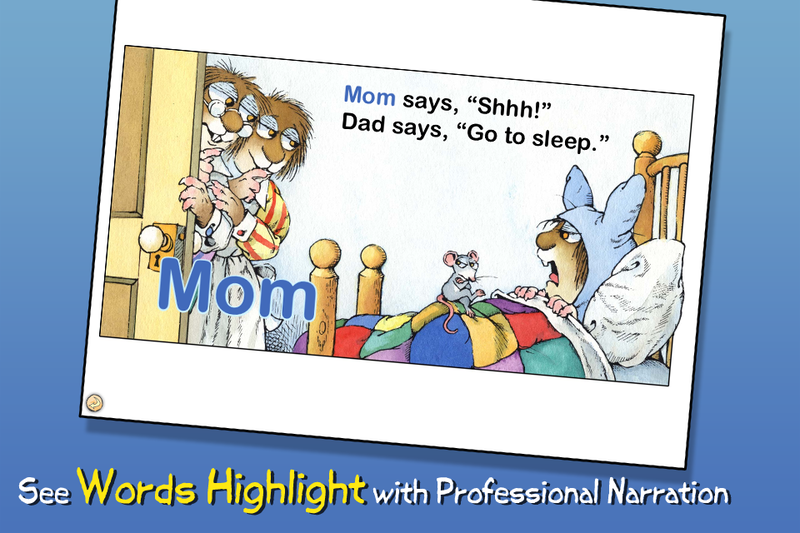 Most images (like the dad, Little Critter and many items in each scene), will name themselves aloud while the word briefly appears over the illustration. For example, touch a mouse and the word "mouse" appears and is spoken aloud by the narrator. If the word is also present in the text on that page, it highlights as spoken, providing nice auditory/visual word-reinforcement for young learners. Little Critter doesn't want to go to bed ... he is so busy playing and is resistant to having his day end. His father is persistent, getting the little guy to go through his usual bedtime routine, like taking a bath and getting his pajamas on. Eventually, all the shenanigans stop; both Little Critter and his father are tuckered out and at least one of them is asleep.